The price of this unit is literally unbelievable and that is mostly due to the savings that you get by not having the back wall sheets. The unit is designed to be placed against a wall or fence and in many of these situations the back wall is not needed. So why would you have a back wall if you don’t need it? Particularly if it saves you a handsome amount. This unit is available in a variety of colours to choose from plus in Zinc (for even cheaper) so you can certainly find the colour that you’re after. 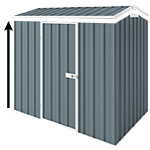 Concrete slab is not required with this shed and wall anchors are included in the shed kit. This high quality Australian made product comes with 20 year warranty.